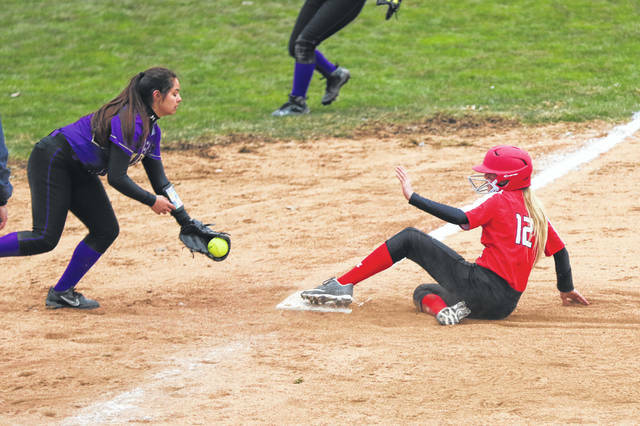 Bluffton’s Haelyn Bischoff slides safely into third base before Ada’s Kiersten Cortez can apply the tag during Thursday’s game at Bluffton. Ada’s Aubrey Madison fields a bunt and throw on to first to secure the out during Thursday’s game at Bluffton. 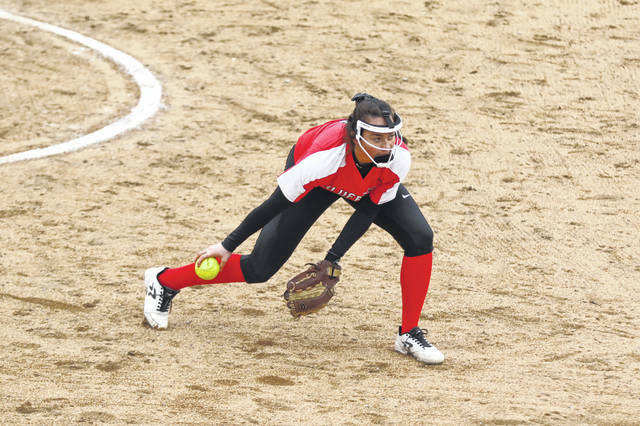 Bluffton’s Libby Schaadt fields a grounder during Thursday’s home game against Ada. Bluffton’s Madison Fleece rounds on her way to scoring a run during Thursday’s game against Ada at Bluffton. BLUFFTON — After Bluffton gave up two runs to Ada in the top of the second inning to knot the score at 2-2, Pirate senior shortstop Averey Rumer gathered the team in front of the dugout with an impromptu pep talk to help refocus her team. The Pirates responded with three runs in the bottom of the second and then scored runs in each of the last four frames to outscore the Bulldogs 9-1 in the final five frames to record the 11-3 win in the Northwest Conference opener for both squads on a chilly Thursday. With the win Bluffton improves to 4-1 on the season and Ada slips to 2-3. Bluffton head coach Tony Rumer said he was glad to get the win but was concerned with the uncharacteristic errors the team committed that led to the Ada runs. Ada was without the services of its ace, Leona Dalton due to a prior obligation and that made beating Bluffton a tough challenge. Ada head coach Becky Dickey said she was proud of her team’s effort against Bluffton. Dicke added that without Dalton hurt the team’s chances but she was not making excuses for the loss. 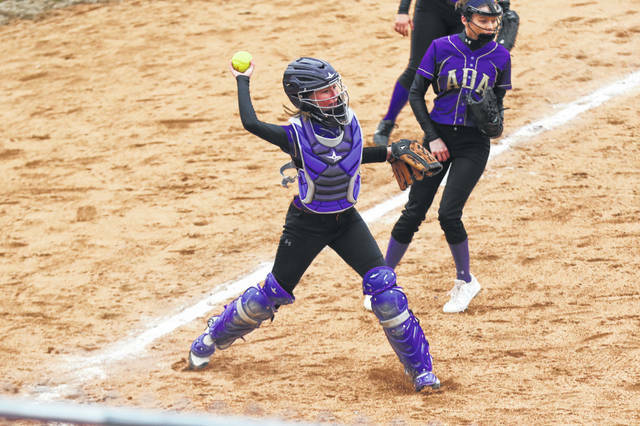 With the Pirates ace on the mound, Libby Schaadt, the junior hurler was sharp for the most part but had to deal with the fielding miscues behind her that led to two of Ada’s three runs. For the game, Schaadt went seven innings while scattering eight hits. She fanned seven and walked none. Ada got two runs, both unearned, in the second inning when the Bulldogs manufactured three hits and scored one run on an error and another run when Schaadt walked in a run. But after that rocky second frame, Schaadt settled into a groove and in the last five frames allowed three hits and one run. The lone run was scored due to an error. The Pirate righty had one-two-three innings in three of the final five innings. Offensively, Schaadt got plenty of support as the Pirates produced 15 hits. All but one Bluffton batter had a hit and three Pirates had two or more hits. Schaadt helped her cause by going 3 for 3 with a double and two singles while driving in three runs. Teammate Mara Minning was 3 for 4 with a run and an RBI and Brinkley Garmatter, who drove in a run and scored a run, was 3 for 5 with a double. 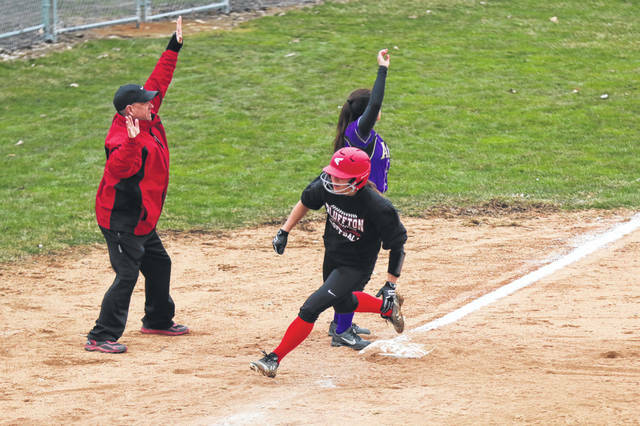 Bluffton’s Katie Prater drove in a run with a triple and junior Madison Fleece scored twice and drove in two runs. This entry was tagged Ada, Bluffton. Bookmark the permalink.